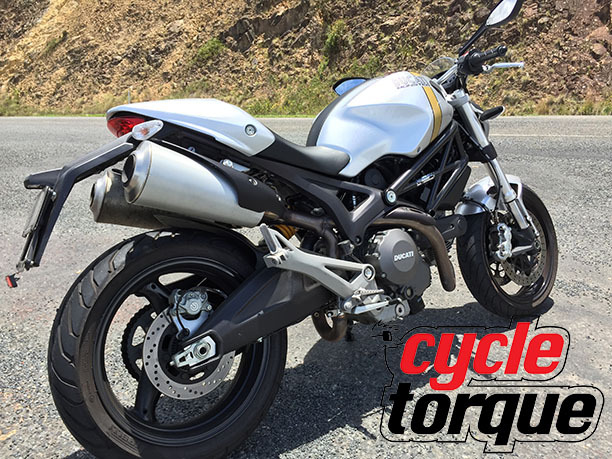 FOR about two months, Cycle Torque’s LAMS approved Ducati Monster 659 was my only mode of transport, and during that time I managed to put about 4000km on it, and in lots of different riding conditions. I’ve ridden it as an everyday commuter, and done a fair bit of touring on it considering the short amount of time I had with it. Over half of the distance travelled would have been on both open and winding roads. The first time I threw a leg over the bike was in the middle of winter last year on a two-day shoot for Cycle Torque TV. Three of us on bikes and two were in the van, we met at the office early and headed to Gloucester and its surrounds, which is about an hour and a half travel. Initially, I wasn’t too keen on the riding position, at 6’4” and a touch over 100kg there isn’t a great deal of room to stretch out between the seat and footpegs. More convincingly for me though was instantly understanding ‘the Ducati experience’ Picko’ talks about. Although it does have a smaller capacity engine, the 659cc L-twin engine gives you enough of a taste of the lumpiness of a Ducati engine to want more. The feeling travels from the seat to the ’bars to make them shake ever so slightly, you can feel the bike accelerate with every revolution. It is impossible to deny yourself a grin from ear to ear. By the time we had arrived at Gloucester about two hours later, my backside and legs d id need a break. What I had found out in this time was if you aren’t expecting a solid bump on the open road, it can take you by surprise. The rear suspension is adjustable for preload only so the issue can only be fixed by rider awareness or by backing off the preload a bit, where for me it can be written off as inexperience riding on some pretty ordinary roads because as I rode further there were fewer surprises. There are Brembo brakes at each end and the bike is equipped with ABS which can give riders a bit of confidence if they are a bit too hard on the trigger. With twin 320mm discs up front, there is a lot of stopping power at lighter braking pressures, so the Monster pulled up quickly in most situations during my time on the bike without ever engaging ABS. After a solid week or so riding the 659 Monster as an everyday commuter, the foot peg to seat height was no longer an issue, which meant I was feeling much more comfortable on it and could spend more time in the saddle, enough time to head up to Byron Bay to attend my best mate’s wedding and have a bit of a working holiday at the same time. 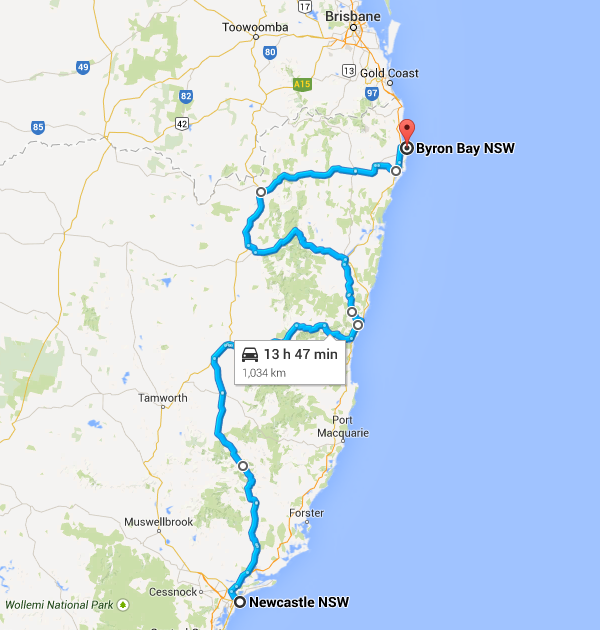 The trip was planned from Newcastle to pass trough Thunderbolts Way, Waterfall Way, the Gwidyr Highway through the Gibraltar National Park to Ballina in two days. The Monster and I loved just about every second of it. Armidale to Dorrigo got a little bit scary, at that time of year sometimes there can be thick leaf cover on the roads, I could tell it was a beautiful part of Australia from the limited visibility I had, though it was eerily scary. Roads were wet and slippery, this was the first time I had ridden in this type of condition, and it is not very enjoyable. 100kmh sections were being taken at a much slower speed because of the low visibility to give myself more time to navigate corners and be prepared for anything like the bad sections of road that had earlier taken me by surprise. I didn’t have one issue with the Monster through this section, tyres, brakes and suspension were all faultless. What soon followed was the tight corners of Waterfall Way, a section of road between Dorrigo and Coffs Harbour, New South Wales where winding road, rainforest and waterfall collide to create what I can only describe as a permanently inspiring riding experience. Not only is this section astonishingly picturesque, but this is where I felt the Monster came into its own – an absolute delight. Here I got to test the acceleration, braking, suspension and handling, where it was simply outstanding. Heightened by the scenery, the Monster allows you to enjoy every metre of road. This bike was being pushed further than the limits of legitimate learners, where restrictions mean sticking under 90km/h and those learners looking for a tourer may not necessarily consider the Monster range as a touring option, because there isn’t a huge variety of storage available for a Monster. As a commuter, the Monster is a fantastic choice once again, enough power to get out in front of most cars and enough stopping power to pull up quickly. Low speed manoeuvres are a little bit more difficult at first because the bike likes a few revs to get off the mark and will initially pull a bit harder than other learner bikes, the rear wheel will start to spin taking off on loose surfaces. Once you get a feel for the clutch and amount of rear brake you need to apply and allow for it, it is business as usual. All commuter rides were under 45 minutes, and there were no issues with comfort. Pirelli Angel ST tyres were also used for the duration of the test and cannot be faulted during the time I had on the Monster. 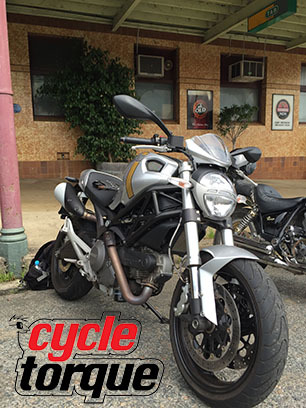 What I can say about the Ducati Monster 659 is if you are a solo commuter during the week and want to get out into the corners on the weekend, if you plan your routes and pack light, you won’t look back. You may have some second thoughts on longer stretches of open roads if you are as tall as me, though the amount of joy you will receive from the tight, twisty corners more than makes up for it, whether you are on your L plates, P plates or beyond. You’d hardly call me a learner, and owning numerous Ducati motorcycles over the years, you’d hardly call me a Ducati newbie either. So why does the LAMS Monster 659 appeal to me so much? I can only say it’s the sum of the bike’s parts which go together to make one special machine. Recently I did a 400 kilometre day on the bike and loved every minute of it. I had initially wanted to take a Ducati 851 I own on the day ride with a number of friends but seeing as this would have been the first decent run for the bike in some two years I decided to ease it back in to service slowly, choosing instead to take the 659 sitting beside it in the garage. I’d already done a few shortish rides on the 659 and was impressed but after a run from Newcastle to Gloucester, up Thunderbolt’s Way to the lookout and then back via Nabiac and Bulahdelah I have become smitten with the baby Monster. I’ve also noticed it has freed up a bit since I last rode it too. It now has over 5000 kilometres on the clock and is running faultlessly. The 659’s power is limited to make it LAMS eligible but this doesn’t detract from the riding experience, even in the country where the open roads beckon. The only time I found the 659 slightly ‘wanting’ was overtaking cars up steep hills, and even then it wasn’t an issue, just that I’m used to having more power at my disposal. For a bike with minimal suspension adjustment, and even then only on the rear shock, it handles very well and can handle quite rough roads. As Ryan said, even taller riders cope well with the riding position, although the seat does push you towards the tank more than perhaps you’d like. Like any riding position this is a subjective take on things, and anyway, I was fine after 400 kilometres of solid riding so it can’t be too bad. For someone who has ridden many machines, and some pretty special ones at that, the little Monster 659 has really impressed me. I love the simplicity of it, the styling (especially with the Imola 72 body kit we have on it), and the way it makes you feel you are riding anything but a LAMS bike.